George Hatcher is a man in his mid-thirties who works as a NASA engineer in Florida. He is married with a two-year old, and ever since he was a young child he has wanted to live on Mars. He may just get his wish. Earlier this week it was announced that George was one of a hundred finalists out of an initial pool of over two hundred thousand being considered to establish a permanent human colony on Mars. 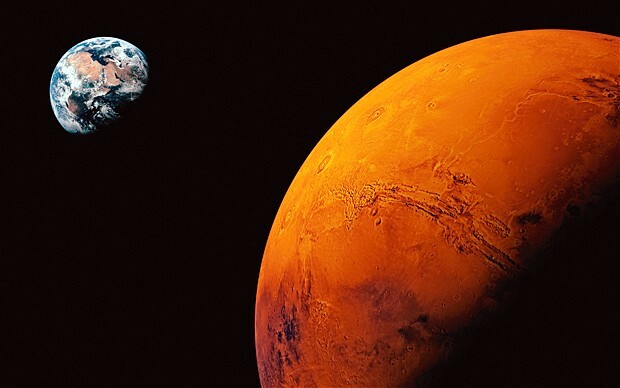 The project isn’t being sponsored by NASA, but by Mars One, a Dutch, not-for-profit foundation interested in inspiring a new generation to continue exploring the vast expanses of creation that exist beyond our atmosphere. I became aware of George’s story because he is an alumnus of the Youth Theological Initiative (YTI), the same summer program of theological exploration to which this congregation sent Lynda Deacon about five years ago. Almost twenty years ago George was a rising high school senior, spending a month with young scholars from around the country on the campus of Emory University exploring the connection between their faith and the pressing issues of the day. Today he identifies as Baha’i, part of a global religious movement with roots in 19th century Persia that emphasizes the unity of God, religion and humanity. Regardless of whether I’m selected to go, making it to the second round of the application process has been more philosophically beneficial that I could ever have imagined. Every deep breath of free oxygen I draw in, every meal I enjoy, every step I take in Earth gravity, every sunset I witness, every moment I spend with my family and friends is more special, more profound, more real than ever before. When you live your life with the knowledge that your years on Earth might be fewer in number than you previously thought, when you know the actual date you might wave goodbye to everything you love, it’s almost like knowing the hour of your death. It fundamentally changes you. For me, it’s already for the better. I did not think it was possible to love life more than I already did. If I could reduce the meaning of tonight’s gathering to one sentence, that would be a contender. In contrast to the almost forced gloom with which some associate Ash Wednesday, what I hear in the ancient reminder, “remember that you are dust, and to dust you shall return” is an encouragement to live, like George, with a sense of your own mortality so that each breath, each meal, each step, each sunset, each moment might be lived to the fullest. So that we all might come to really love the lives we’ve been given to the fullest, rather than squander them in anxiety and despair. There is a way of marking the season of Lent that focuses on generating a mood of self-denial for self-denial’s sake, that turns the forty day fast into a kind of spiritual marathon in which one can demonstrate to one’s self (and anyone who asks) a measure of Christian fortitude through the denial of pleasure — whether that be the traditional forsworn vices of coffee, or alcohol, or chocolate; or the more modern swearing off of television or social media. Without presuming to know every reason a person might choose to give up any of those activities, I’ll just say that I worry they miss the point. The emphases on almsgiving, prayer and fasting outlined in Matthew’s gospel are not intended to create spiritual tests for us to pass, or to generate mild forms of suffering to help us empathize with the deeper suffering of Christ on the cross. These disciplines, as I understand them, are an invitation for us to notice all that diminishes our experience of the great gift of life that comes to us as an unmerited gift by the God who is revealed in Jesus as the voice of truth unmasking the interlocking set of lies that hold us captive to a vision of life that is literally killing us all. If I fast during the season of Lent, as Muslims do during the season of Ramadan from sunrise to sunset, it is not so that I will experience the suffering of hunger pangs, but so that I will be moved to consider the hunger that is experienced in and out of season by the world’s poor; so that I will be moved to deeper prayer; so that I will take the money I might have spent on food and reallocate it toward acts of mercy, justice and advocacy for those who are hungry every day of the year. My fasting brings me to consciousness of the painful brokenness of the world, my prayer moves me to action as my almsgiving, my offerings, create the change I long to see. All of which is good practice for the life of baptism, for which the season of Lent has historically served as a time of preparation. As we move through these forty days toward the festival of the resurrection at Easter, we are moving into a deeper awareness of the call we each receive in our baptism to repent; to notice, name and turn away from all the death-dealing powers of this world, so that we can more fully embrace the gift of the life God has given to each of us, and to the whole world. What is it that generates distress in your life? What lie does the world whisper in your ear that keeps you up at night? Is it that you aren’t young enough? Old enough? Is it that you are too large or too small? That you don’t have enough money, enough education, enough experience, enough friends, enough time? Dear ones, those voices lie. You are God’s own beloved but we are living in a world drowning in lies. God has a different flood in store for you, a different deluge in which to wash you. There are waters that unite you to the rest of life on this planet, and beyond. Consider this night what you need to confess, what you need to remove from your life, what you need to eliminate from the menu of ideas and goods and habits the world keeps trying to force feed you. Consecrate this night a holy fast, a simplification of life, so that you might come to the great feast of Easter awaiting us all and be able to affirm a love of life deeper than you’ve ever imagined before.